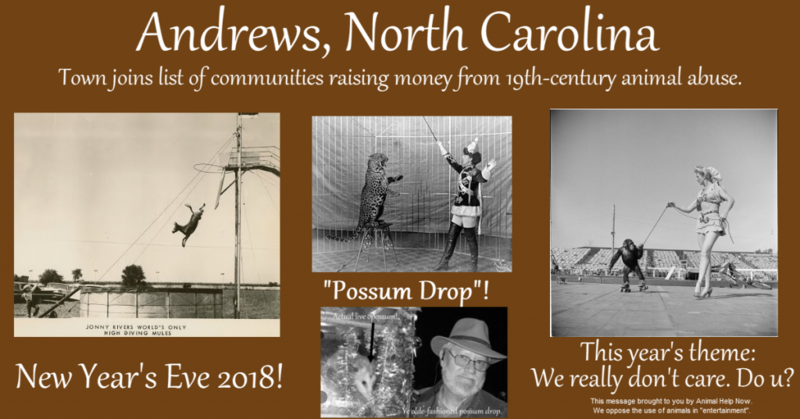 The ridiculous, cruel and anachronistic opossum “drop” in Andrews, North Carolina, went ahead last night as planned (video). Our hearts go out to the little one who was abused as this sad public “tradition” continued. In his or her honor, I’ll humbly suggest we all think hard about how our own behaviors – our private “traditions”, perhaps – might harm others. Is our own entertainment truly cruelty free? Any circus involving animals is not. Nor is any zoo or aquarium. Any movie involving actual animals likely was unpleasant for them; many have been downright cruel or indeed deadly. A tiny sampling of movies in which animals either died or were abused during production. The food that sustains us? Are we eating in a way that causes the least harm, to both animals and to the planet? Food production on an industrial scale leaves no room for animal welfare. After living short, miserable lives, chickens may be scalded alive during slaughter. The fish in this scene are mostly alive. 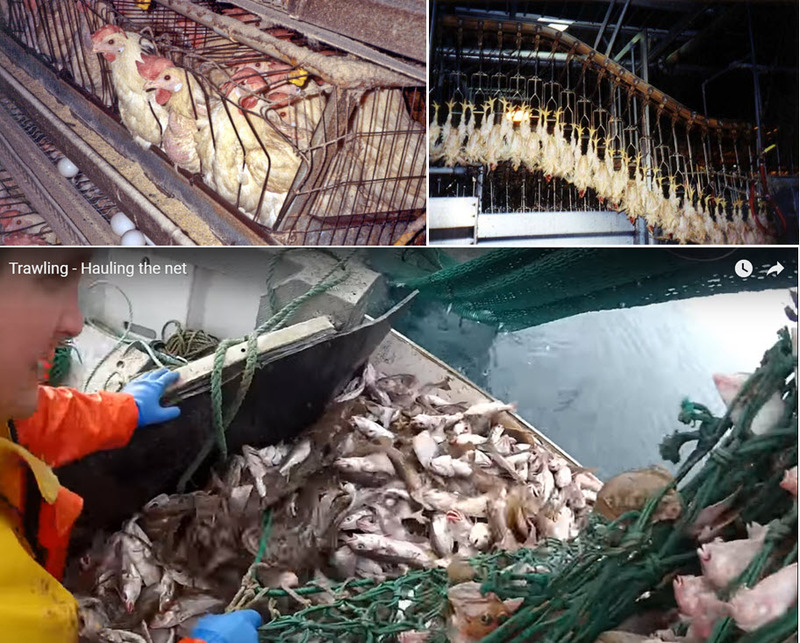 They were crushed as they were pulled in massive nets from their homes, and then this worker carelessly steps on them as they suffocate to death. Our household products? 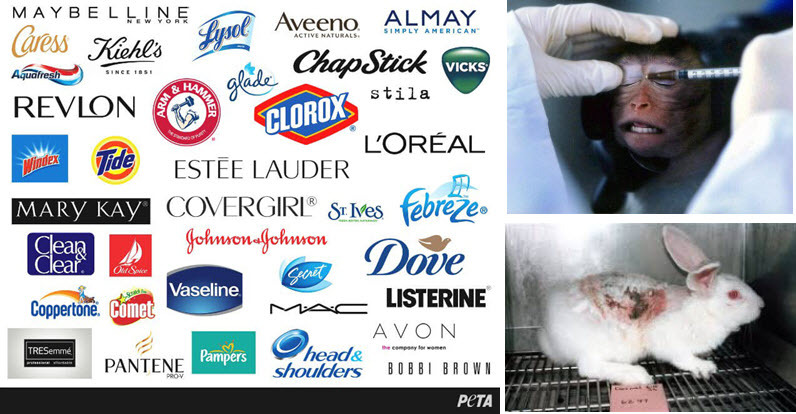 Are we still buying products “tested” on animals? They’re certainly still being produced! New and Improved? What we need is a new and improved ethic toward animals. We humans pride ourselves on our scientific accomplishments, but we continue to kill animals to meet some archaic regulation ostensibly protecting humans. From laundry soap to cotton swabs, our purchases matter! Our investments? Are we supporting companies that exploit natural resources? Are we cutting back on plastics? Even just a little? In a room full of antagonists (say, NYE revelers), the persecuted protagonist (opossum) is easy to spot and easy to sympathize with. 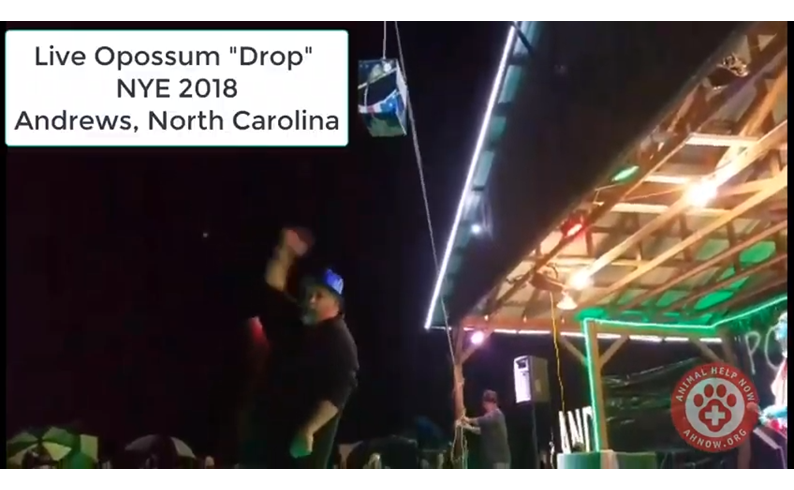 We have a whole year to stop the next opossum “drop”. Imagine all the other positive changes we can make during that time! With Hurricane Michael hammering the Florida Panhandle and surrounding areas, we’re facing yet another harsh reminder of the fragility of life. We know you join Animal Help Now in our hopes that those in the hurricane’s path can make it to safety and ensure that their dependents do, too. Sadly, we were reminded just last month that many animals are simply left to die, including not only dogs and cats, and fishes in aquariums, but also and on a much, much larger scale, pigs and chickens and other “food” animals, whose anonymity dooms them. As to wild animals and wild places, even with their millions of years of evolutionary toughening-up, many can offer no contest to the violence of today’s storms. 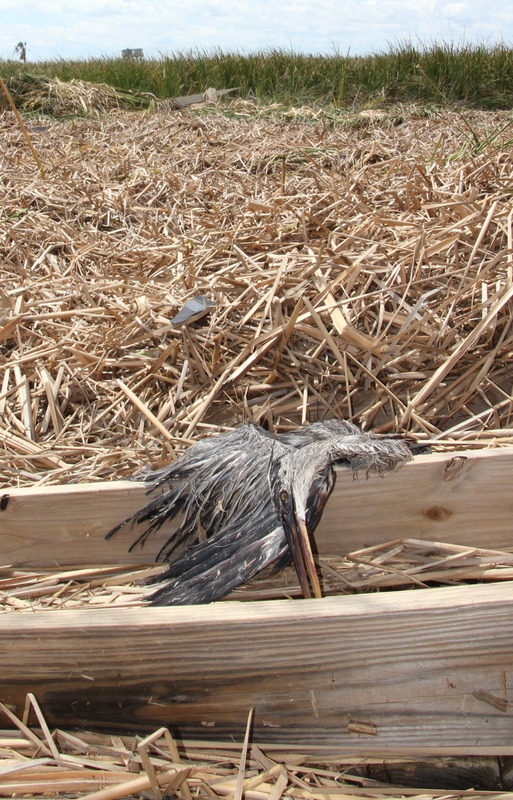 Many shorebirds seeking shelter in local wetlands, like this great blue heron, were devastated by storm surge in Hurricane Harvey (Port Aransas, TX). Many of those who were found alive and rescued were taken to the Texas Sealife Center for medical attention and rehabilitation. Photo: Tim Tristan. Green sea turtles transported to the Texas Sealife Center in Corpus Christi after Hurricane Harvey. 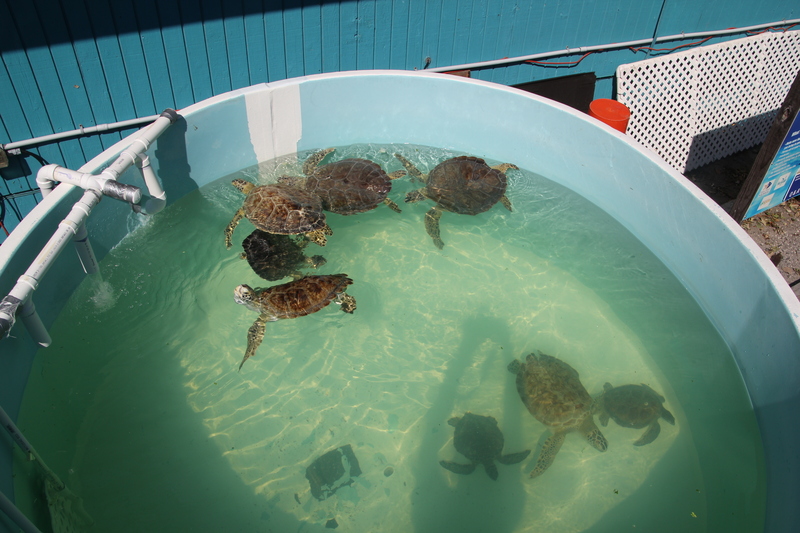 More than 50 sea turtles were housed and cared for at the facility. Photo: Tim Tristan. The climate is changing, and the impacts are larger and coming at us faster than almost anyone predicted. As the International Panel on Climate Change reported last week, we need to act now, as in now, as in right now. Today. As to today: at Animal Help Now, we recognize the huge role that human food systems play in climate change. Choosing to eat lower on the food chain is perhaps the single most important thing a person can do each day to positively impact the climate. When we farm to feed humans directly instead of farming to feed cows and pigs and chickens to then feed to humans, we use less fossil fuel and we require less farmland. I can almost hear a rainforest saying, Thank you. 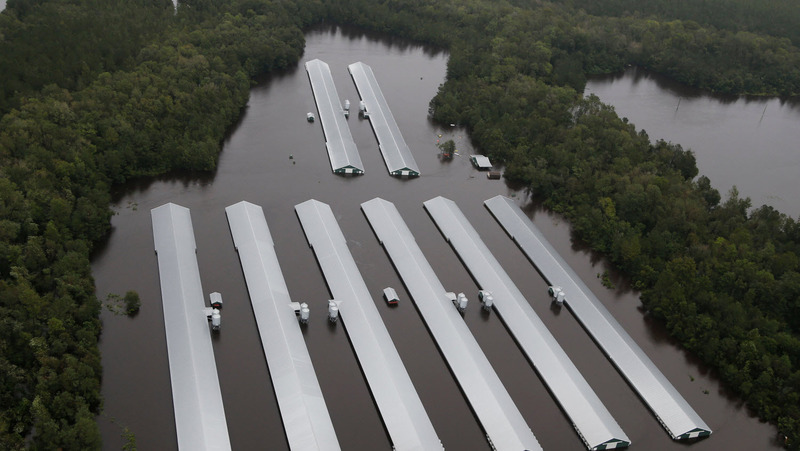 Millions of chickens and thousands of pigs suffered terribly and died during Hurricane Florence. This is about as close as cameras are allowed. Photo: USA Today. What’s that, coral reef? Plant-based diets also benefit coral reefs, not only from a global warming perspective, but also by rejecting factory fishing and its concomitant destruction of marine biodiversity. Discarded fishing line and nets alone are reason enough for Animal Help Now to exist. Through the unparalleled devastation of Hurricane Harvey, some animals remained resilient. 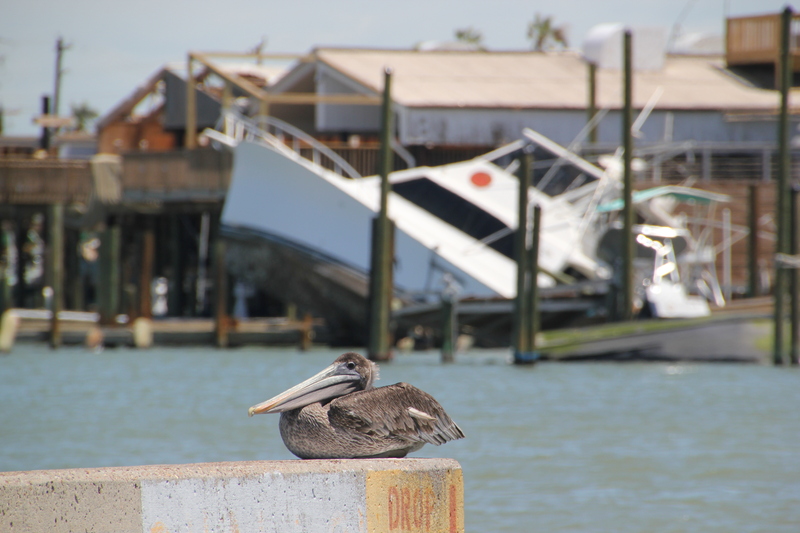 Here, a surviving brown pelican. Photo: Tim Tristan. 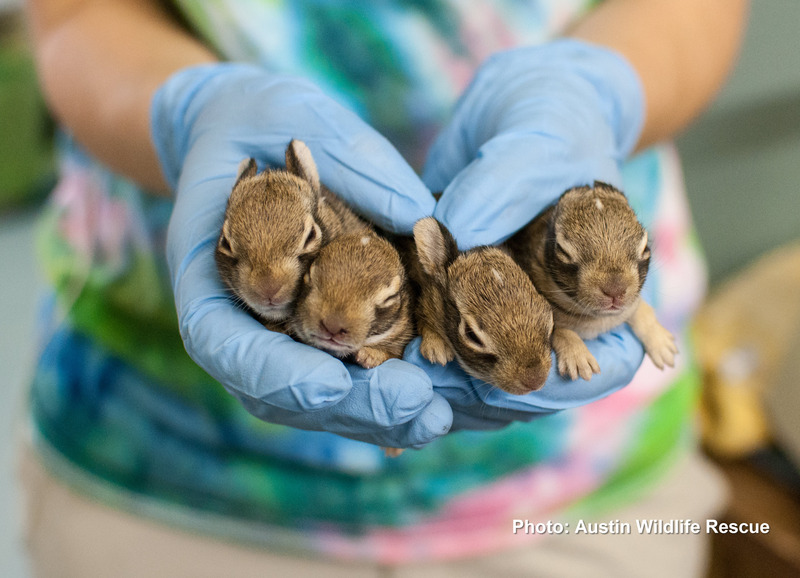 Bunnies orphaned during Hurricane Harvey. But the maelstrom of human misbehavior has much larger consequences, as we are now witnessing in the Gulf. This week Animal Help Now has been busy ensuring our list of wildlife experts in and around the Florida Panhandle is up to date so we can best serve people who encounter wildlife in need as the storm moves through. Of course, most area wildlife rehabilitators have rightfully left for higher ground, serving as a final jolting reminder that each of us needs to act today to mitigate the severity of storms of the future. If we don’t, we’ll all soon find ourselves in a constant state of retreat. 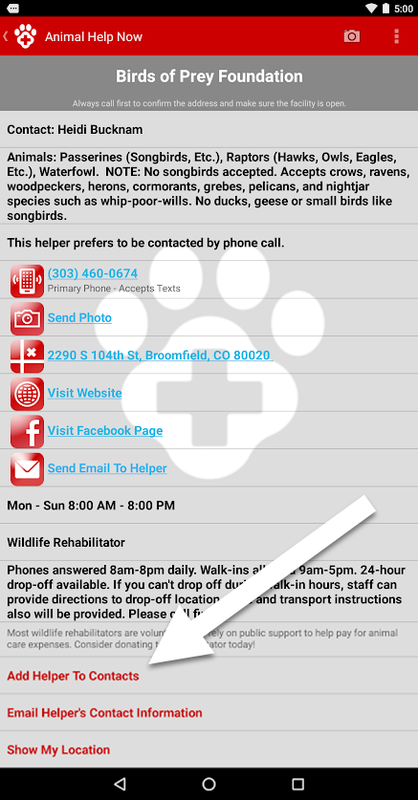 Use Animal Help Now (website, iPhone app, Android app) to find assistance right now for injured or distressed wildlife. This article was originally published in New Mexico Vegan. Think fast. Your neighbor’s cat has injured a bird. You’ve managed to scare off the cat, and now it’s just you and the bird, who’s dazed and bleeding slightly. Many of you know the answer. And not only do you how to get to your local wildlife rehabilitation center, you also have the center’s phone number on speed dial, just in case. But what if you’re out of town and away from your known resources? Or what if you’ve encountered an animal that your local center won’t accept – say, an injured bobcat, perhaps? Animal Help Now is the country’s first wildlife emergency application. It’s available for free on the internet at www.AnimalHelpNow.org (www.AHNow.org, for short) and as both an Android and iPhone app. Think of Animal Help Now as a high-tech wildlife 911. You open the app and tap Wildlife Emergency. The app quickly lists the contact information for the nearest wildlife emergency professionals. You tap a phone number, and you’re on your way. It’s that easy. Some of you at this point “get it”. You’ve encountered injured or distressed wildlife, and you know that at that moment nothing is more important than finding the right help right away. You may be like me, in that animals in need tend to throw themselves into your path. I’ve helped scores of injured and distressed wild animals, especially since moving to Colorado in 1991. Rattlesnakes, pigeons, geese, mice, voles, prairie dogs, … Even a red-tailed hawk. 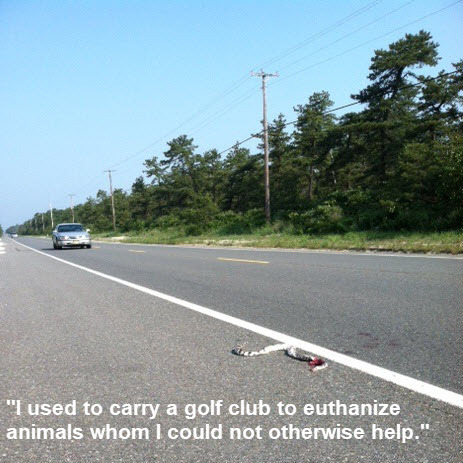 I used to carry a golf club to euthanize animals whom I could not otherwise help. A snake with a broken spine on a long, hot stretch of eastern Colorado road comes to mind. I didn’t know what else to do. I actually still carry the club, just in case, but I no longer struggle to find assistance if it is indeed available. I’ve used Animal Help Now dozens of times since we created it. The club? Not once. 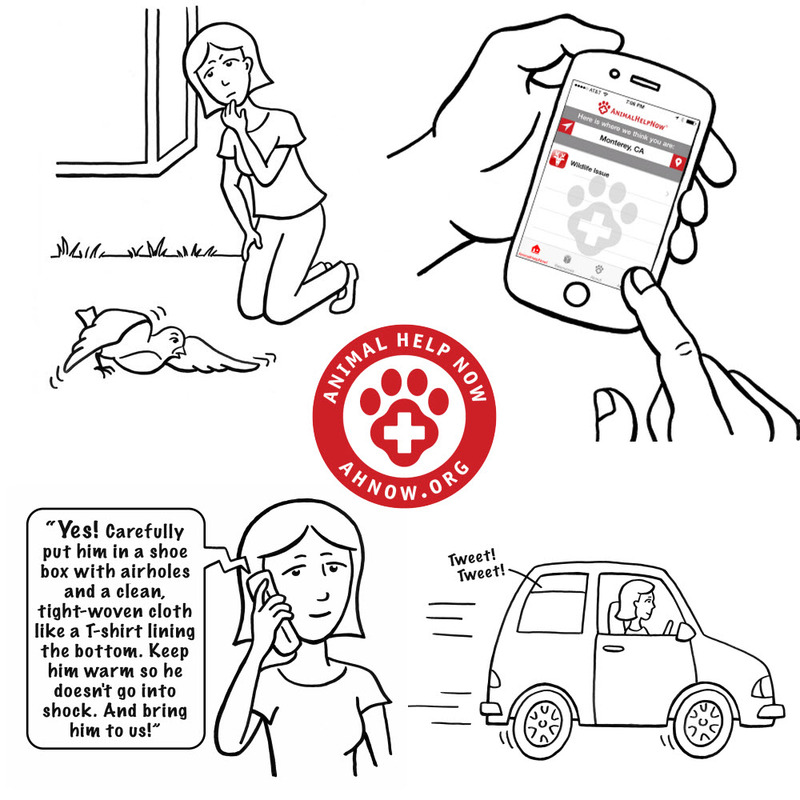 It was not just my personal experience that revealed to me the need for an easy-to-use animal emergency app. (And, yes, in its first incarnation and actually up until last year, Animal Help Now could also be used for domestic emergencies – including cats, dogs, cows, chickens and pigs.) My professional experience clearly confirmed the need. 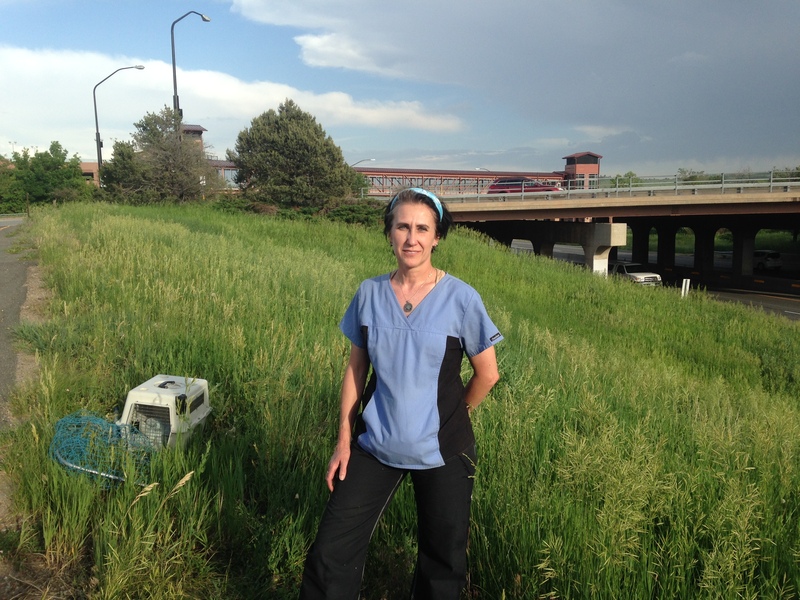 As long-time executive director of Rocky Mountain Animal Defense, a now-defunct (but very effective in its time) Colorado-based animal rights organization, I saw day-in and day-out that people who encounter animals in need do not know what to do to help. They just don’t know. And even my colleagues and I in the RMAD office would often have to do a lot of legwork to help out if people were calling us from outside our Front Range comfort zone. Some significant anthropogenic threats to wildlife, such as catastrophic climate change and conversion of wildlife habitat to human use, are essentially outside the purview of Animal Help Now. The animals we are able to help are those who people encounter in their day-to-day lives: the bird who hits a window, the baby rabbit injured by the neighbor’s dog, the raccoons by the side of the road whose mother has been killed by a car. One billion birds are estimated to be killed in window strikes in the United States each year. A billion is a hard number to imagine, so, as difficult as it may be to believe, a billion a year is 30 fatal window strikes per second. 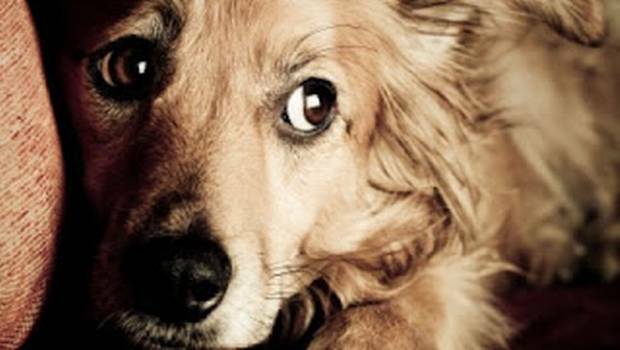 About four times that many are killed by cats and dogs. About a half billion are killed by motor vehicle strikes. The number of animals injured from these same causes is likely in the billions, as well. It is no wonder that usage of Animal Help Now has doubled nearly every year since we launched. Last year we assisted in an estimated 26,000 emergencies. Animal Help Now is but one component of the field of wildlife emergency response and treatment. This community includes wildlife rehabilitators and veterinary professionals, and the people who support them, including donors, administrative staff and others. In some areas, the wildlife emergency community it includes in-the-field rescuers and wildlife transporters. Several parts of the country are served by volunteer-based wildlife hotlines. The Dallas/Fort Worth area has an excellent one, as does (jointly) Missouri and Illinois. 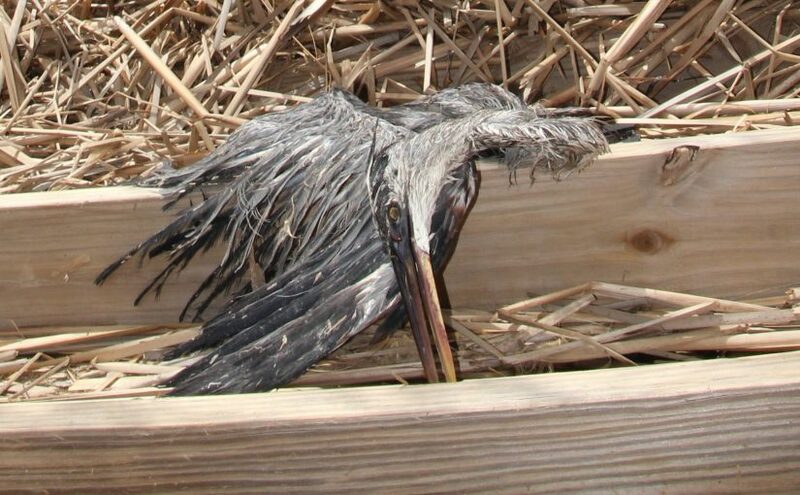 Many of the coastal stranding and entanglement hotlines are run by volunteers or government agencies. Animal Help Now lists these helpers to users in those areas. If you use our app on any coast anywhere in the United States, you will be given quick access to whichever marine animal hotlines serve that coastline, just in case your emergency involves a sea turtle, a stranded dolphin or even an oil spill. Animal Help Now has an added benefit for dispatch operators, animal shelters, vet clinics and other entities that occasionally or frequently field wildlife emergency calls. It is our “referral” functionality, which allows a person in one location to help a person in a different location. So if I’m working for New Mexico Wildlife Center in Los Alamos and I get a call from eastern Arizona for help with an injured coyote, I can use Animal Help Now to point the caller to people in her area who can help. Just today a person telling me about her use of the app said she felt bad about cutting up mealworms to feed to a Carolina wren she had rescued. I wrote back telling her I feel the same way. And I said it hits even closer to home for me in the case of carnivore rehabilitation. This is where education and prevention enter the picture. The more we work together to mitigate the threats facing wildlife, the better our world will be. Animal Help Now has an ambitious education program focused on helping humans be better neighbors to wildlife. For instance, on window strikes, did you know that affixing a bird sticker to a window has virtually no deterrent effect on bird flight behavior? The fix is easy, but it’s not quite that simple. 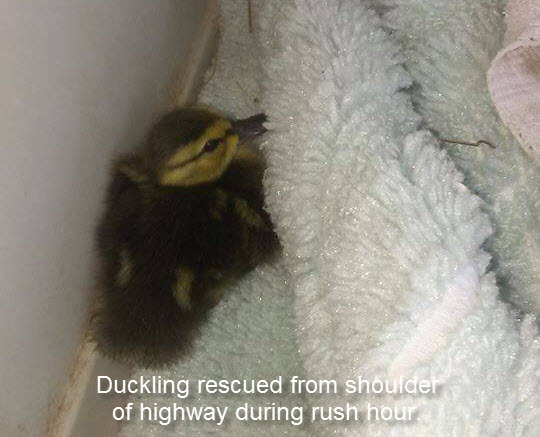 See the Resources page on www.AHNow.org for the full story, and for other useful information, such as how to create your own wildlife rescue kit for your car or home. This year we also completed the launch of our new functionality that directs people who need help with a wildlife conflict – squirrels in the attic, skunks under the porch, etc. – to humane wildlife professionals who can assist. I encourage you to download our app (search stores for Animal Help Now) and bookmark our website (www.AHNow.org). Please give us a good review, if you’re so inclined. Check us out on social media. And even though we’re mostly volunteers, please consider a donation. You can claim to have been an early investor in the world’s first wildlife 911 system! Finally, if you want to work for animals in hands-off ways but you don’t know what to do or where to start, please get in touch with us at Animal Help Now. There are about a thousand things that need to be done. — I sicken a little to think of all the insects I kill when traveling in my car. So I’m extra careful when on foot. This little fellow – the size of a cherry pit – narrowly escaped death when I rushed up the back step yesterday. I do tend to pay attention to where my feet will fall, but I was extra vigilant in my foot travels the rest of the day. And what did I see later at a park but my first toad of the year. 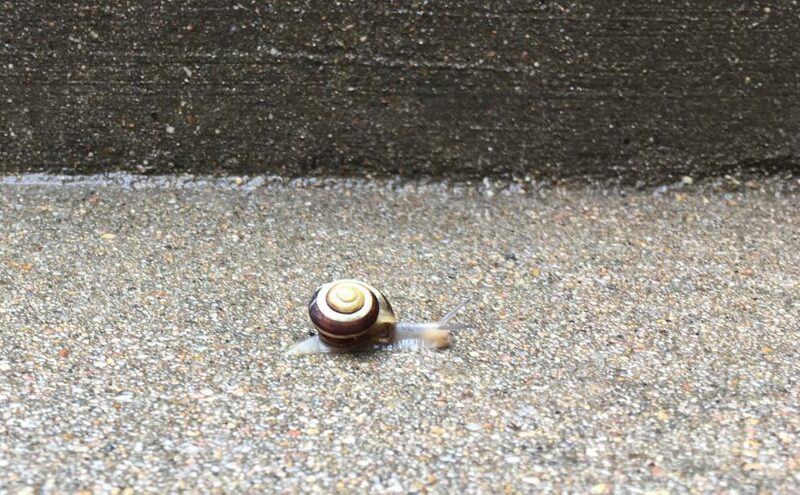 If it takes a snail to remind me to slow down, that’s just fine. Posted on September 7, 2018 September 7, 2018 Categories Living with WildlifeTags life, pace, slow down, snail, toadLeave a comment on Watch your step! Yesterday on my way into Boulder on Highway 36 I noticed a person with a net looking through deep grass off the road’s shoulder. I figured she was looking for an animal of some sort, so I stopped to offer my help. And there was my friend and fellow advocate, Nicole. And sure enough, she was looking for animals – specifically, ducklings. She had been on that stretch of road earlier in the day and saw a mother with eight or nine babies, walking along the shoulder. By the time she could turn around and get back to where they were, the mother and several of the babies had been hit and killed. Nicole, at the incident scene. Like so many thoroughfares, Highway 36, which links the Colorado cities of Denver and Boulder, becomes a gauntlet of death for wildlife each spring and summer. No safe wildlife crossings are to be found, and those who attempt to cross must navigate 4-6 lanes of incessant traffic. Even birds and foxes and other nimble animals who have adapted to high speed vehicles are likely to die when faced with the reckless driver traveling 20 miles per hour over the speed limit. At this time of year especially I try not to schedule anything that absolutely positively requires me to be on time. This allows me to keep my eyes open for anyone who has been injured or is trapped along a median, and to stop and try to help when needed. I’m not virtue signaling. I don’t relish this in the least. I hate that animals who have evolved over millions of years – even dinosaurs, for Christ’s sake – are getting violently injured and killed by the millions on our roads each year. I hate that their deaths are barely noticed, if noticed at all, by their killers and by passersby. I hate that the person who hits a deer is more concerned about the damage to their vehicle than the pain, the death, the injury they caused, or the fact that the mom or dad or sibling or friend who went out that morning will never be seen again, leaving at best an emptiness that humans can and should understand – and at worst dependent young, robbed of their birthright and sentenced to a frightening and protracted death. I hate that humans have normalized being in a hurry and that our own evolution has led to an insane separation from nature and an all-costs pursuit of comfort and convenience. One of the four survivors, safely away from the road. Millions of years of evolution will not prepare a vulnerable animal for an encounter with an uncaring human. Nicole was able to save four of the ducklings, delivering them into the good hands of a nearby wildlife rehabilitation center. Because she cares so deeply, she had returned that afternoon to see if she could find any others who may have survived. After a thorough search, she was packing up when I arrived. 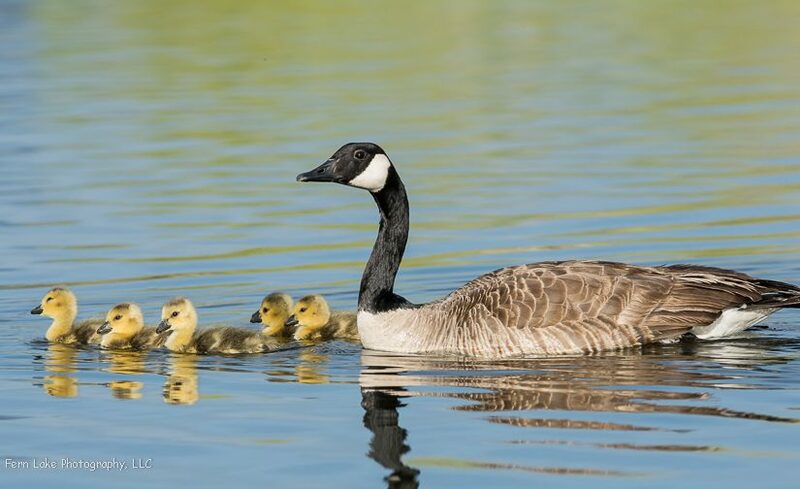 She hadn’t found any more ducklings, but she wasn’t leaving empty handed, as she’d picked up some recyclables, likely tossed from vehicles by uncaring humans. Here’s to you, Nicole, and to all with wide and welcoming circles of compassion. You are this planet’s hope. If you encounter a wild animal who needs your help or if you have a “conflict” with wildlife at home or work, use Animal Help Now to find the nearest assistance. It’s always smart to have a box or carrier of some sort in your vehicle. 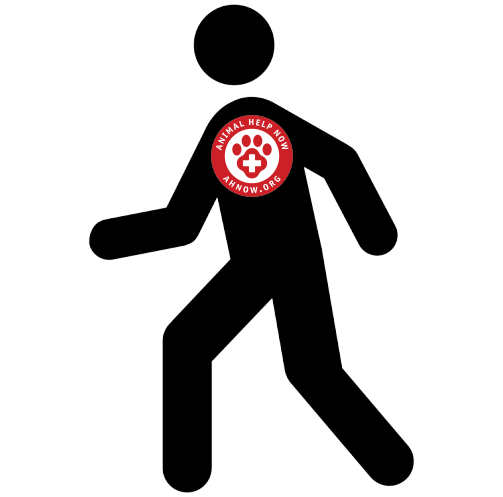 Click here to see what Animal Help Now recommends for a full rescue kit. To support Animal Help Now’s work, please visit www.AHNow.org/donate.php. Until Google develops a better system of communicating to Android app users about the various ways that apps interact with a user’s list of contacts, Animal Help Now is pulling its “Add Helper to Contacts” functionality from its Android app. We are doing this because a few of our users have expressed concerns about Animal Help Now invading their privacy. This, despite the fact that Animal Help Now cannot access their contact lists. All we can do is add a helper to their contacts – at their behest. We are saddened that governments, for-profit corporations and even some non-profit corporations have violated the public trust, that public trust in general is evidently eroding as we move further into the 21st Century and that these dynamics together are making the world even more dangerous for the most vulnerable in our society, including our animal friends. It’s enough to drive us mad. Our nonprofit organization helps people with wildlife emergencies find the nearest professional help. We recently added a feature that allows users to add a wildlife emergency professional’s contact information to their contacts. We are now hearing from the public that they will not download our app because Google is telling them we need “Access” to their contacts and they do not trust that we will not violate this access. If Google were to make it very clear that the access we need is “write only” and that we cannot see the users’ contacts, we likely would not be losing users and users’ trust. Further, if Google were to allow a person to download the app while exempting the contact access, this would also solve the problem. As it is, the existing solution is untenable and, unfortunately, in this age of distrust, indefensible. One must, as has been said, avoid even the appearance of impropriety. Animal Help Now received an email today from Mike M, who wrote: I like your app, but I won’t be using it any longer or recommending it because the latest upgrade wants to access my contacts. Respect user privacy. I can see where Mike is coming from. He went to update his Android app and saw that we now request access to his contacts. After all, why on earth would the Animal Help Now Android app need access to Mike’s contacts? Before your imagination gets on a plane to Russia, allow me to give you the quick and complete answer. 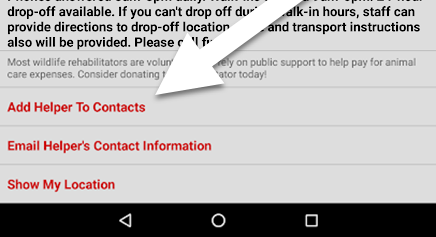 The Animal Help Now app needs access to Mike’s contacts because we now offer a new feature that allows Mike to save a wildlife rehabilitator’s contact information in his contact list (see image). This does not mean we can see Mike’s contacts. We cannot. Let me say that again: We cannot see Mike’s contacts. We added the “Add Helper to Contacts” functionality because we want to make it as easy as possible for Mike and our other users to contact his area wildlife rehabilitators today, tomorrow, anytime. Unfortunately, Android doesn’t give us the opportunity to explain that we are not asking for permission to access our users’ contacts, unless the person downloading the app happens to read the “What’s New” section in our store. What’s worse, it’s an all-or-nothing thing. If Mike doesn’t want Animal Help Now to be able to his contacts helpers of his choosing, Android won’t let him upgrade his app. Thankfully, Apple takes a more reasonable approach. The company doesn’t even ask for your permission to let Animal Help Now add a helper to your contacts until you try to do so, and it certainly doesn’t require you to give us this access before downloading our app. Recent events have heightened privacy concerns. Facebook and so many others have shown themselves to be untrustworthy. As a result, people seem warier than ever about others’ intentions. Watch your step! In 2018 more than ever. 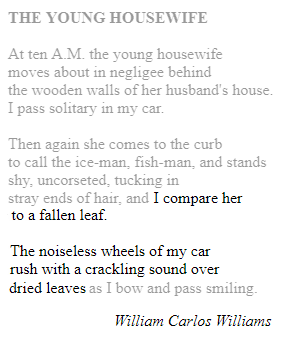 It’s a cold, sunny day, and you’re strolling alone on a sidewalk in an unfamiliar neighborhood in an unfamiliar town. Enjoying the new sights and sounds, you don’t notice the black ice patch until it’s too late. You hear your forearm break as you hit the frozen concrete. You cry out. The fracture is compound. There’s a new bend just above your wrist. The pain hasn’t yet hit, but you feel sick. The sound of hurried footsteps offers some relief, as you try to breathe and gather your thoughts. You look up to see a person quickly approaching. He looks a bit panicked and before you can warn him, he too slips on the ice. Thankfully he isn’t hurt and is quickly back on his feet, but when he sees your injury he gets woozy and takes a knee. Another person arrives. This one is a bit circumspect. She too kneels next to you, but her countenance is one of calm and concern. She looks you in the eye and asks if you have injured anything other than your arm. Thankfully, you don’t think so. She then removes her coat and wraps it around your shoulders. She directs her attention to the other person, asks him if he’s OK, tells him to take some deep breaths and then directs him to attend to you while she gets her car. Now, in case you haven’t guessed, this is a bit of a parable. In the context of Animal Help Now, it can be read rather literally, which is to say if you come upon an emergency, keep your head. But I mean it also in a larger sense. An argument that the entire world is in a state of emergency is fairly easy to make (wars, famine, ocean plastic, catastrophic climate change, etc.). As to Animal Help Now’s particular corner of the world – the interface between humans and individual wild animals – this argument is easier still. Billions of wild animals are injured or killed in the United States alone every year, from cat and dog attacks, window strikes, vehicle strikes, etc. And as humans continue to leave their mark on the planet, wildlife impacts still do not factor in as they should. Witness this deliberate construction of a bird death trap. Your broken arm is best addressed through dispassionate, considered, expert care. Helping a bird injured in a window strike is best addressed through dispassionate, considered, expert care. Helping address the myriad and increasing anthropogenic threats to wildlife is best accomplished through dispassionate, considered, expert care. While concern for others is the font of so many good acts and good efforts, untempered it can lead to incautious and inexpert action. Which is all simply to say, to those of you who act on your concern for others, please join Animal Help Now in our pledge to do our best in 2018. Watch your step! Those “others” are counting on us like never before. 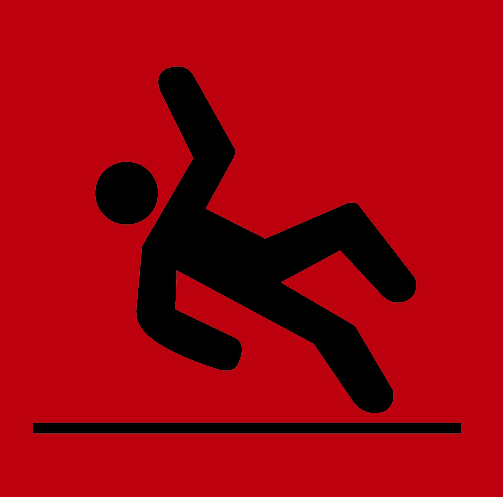 Posted on January 1, 2018 January 1, 2018 Categories UncategorizedLeave a comment on Watch your step! In 2018 more than ever. 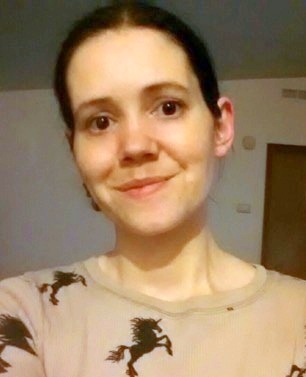 Animal Help Now’s December Animal Hero award goes to Jasmine Fletcher Glaze, director of A Soft Place To Land in Graham, Washington. Jasmine has been working with animals since the age of 14 and rehabilitated 300 – 350 mammals a year at her home-based facility … until now. 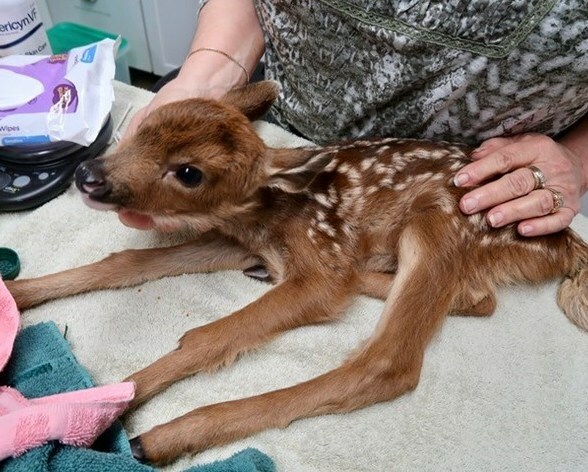 Last month, a WA wildlife rehabilitation facility that Jasmine respects suffered a seizure of animals by Washington Department of Fish & Wildlife (WDFW). 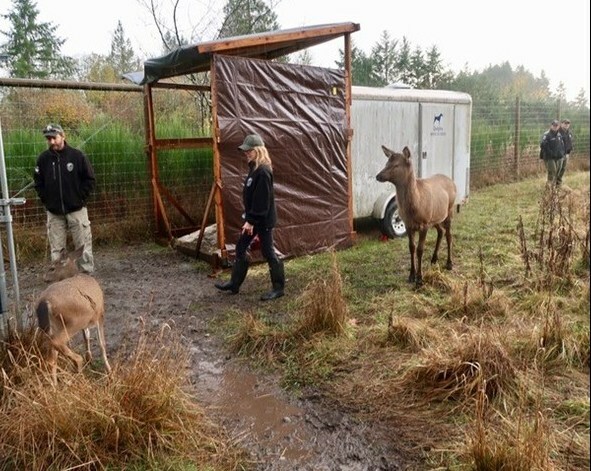 A former volunteer at For Heaven’s Sake Animal Rescue and Rehabilitation (FHSARR) told WDFW that the deer and elk being cared for at the facility had been exposed to excessive human contact, which caused them to become habituated to humans. 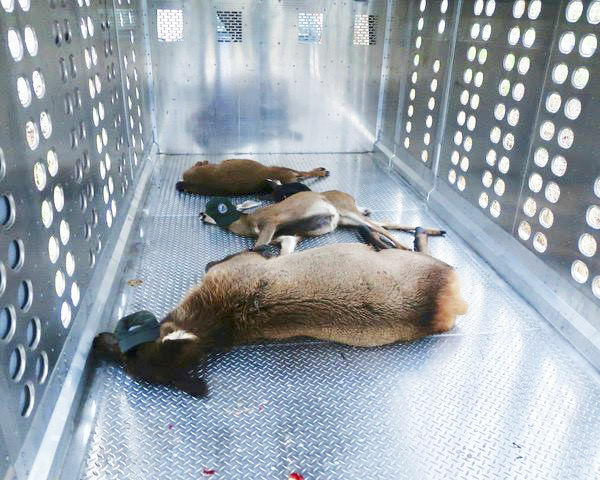 WDFW officials visited FHSARR Nov. 9 and tranquilized a young elk and three bottle-fed fawns onsite, then took them to another location and killed them. Officers also tried to capture 11 additional deer as they fled into the woods. The agency will evaluate these animals for release by March. Jasmine notes this was not an isolated incident and that the agency has taken and killed animals from other wildlife rehabilitation facilities. WDFW declares that the state owns all state wildlife and is charged with managing them. Others state that wildlife belong to the public and that the agency is mismanaging them. Jasmine knew she would be devastated if the state ever killed the animals in her care, and the fact that officials can take such drastic action without due process was too much to bear. She wanted to effect change in WDFW, but like other rehabbers around the country, she knew the agency could act with impunity and without what a reasonable person would consider to be due process. Jasmine figured out a way to be heard. She took the bold step of closing her facility when the last animal was ready for release and requested WDFW deactivate her wildlife rehabilitation permit, effective Dec. 1. We encourage the WA public to request an overhaul of the agency’s approach. The WDFW Commission is meeting Dec. 8 and 9. Jasmine’s sacrifice and efforts could have enormous implications. We don’t want the FHSARR elk and fawns to have died in vain and hope WDFW will agree to allow release of the 11 remaining deer it has targeted come spring. We support and commend Jasmine for speaking out as we award her Animal Hero of the Month. Among the several reasons to enjoy July 4 in the United States is the calm that comes about when this country takes a collective recess from work. Not a collective meditative calm, which is hard to even imagine, but at least a recreational calm. Everyone’s playing. Or eating. Or chilling. Or whatever. To be sure, the commutes are light. And there’s a welcome stillness in the air. Which makes tonight all the worse. That stillness – not to appear overly dramatic here, but that’s the calm before the storm. Tonight’s fireworks are going to create an unfathomable amount of duress across wildlife communities and of course among domestic animals. We all know dogs and cats who run and hide at the sound of the first firework, some who shake uncontrollably for hours. Surely many pigs and chickens and cows suffer likewise, though being out of sight, their plight is unnoticed. It’s not hard to imagine that many animals in laboratories are adversely affected, too. “Ralphie” the buffalo mascot of the University of Colorado will be trotted out for the amusement of the crowd at tonight’s event at the campus stadium. Buffalo and bison are known to be highly sensitive to sound. I remember seeing a fox absolutely disoriented and terrified outside the stadium at a celebration many years back. She somehow found herself in the middle of the huge crowd of people agog at the flashing lights and loud bangs. I’m not sure I’ve ever seen an animal so alone. The companion animals inside our homes are the best off. They are less likely to get physically hurt. They won’t be running into traffic or fleeing blindly into the night. Those who are terrorized or made anxious by fireworks may be helped by wrapping a towel or sheet around them (or using the popular Thundershirt, which operates on the same principle). Some will benefit from pharmaceuticals or natural remedies. Many will benefit if you close your windows and turn up the volume a bit on whatever it is they like hearing. Keep them busy. Keep them inside. I feel, too, for the veterans and others among us humans for whom fireworks are traumatic. I know how I sound, but give me a magic wand, and I won’t make fireworks go away; I’ll make them enjoyable for everyone. Such wands being in short supply, I’ll hope for the best tonight, and I will welcome tomorrow’s light, though with the sad knowledge that our celebrations resulted in so much trauma to our animal friends – domestic and wild, alike – and in countless of their lives being lost or shattered. Is it wrong for me to expand the concept of Mother’s Day? I hope not, ’cause here I go! First off, a happy Mother’s Day to all of you who are mothers in the conventional sense. May your special day be filled with peace and love, and may you know your hard work is appreciated. A happy Mother’s Day, too, to all of you who have found other or additional outlets for your maternal instincts. To you who work to make the world a better place. To you who mother the world or even the tiniest part of her as if she were your own child, day in, day out, year upon year upon year. Animal Help Now is building out its board of directors and advisory council. We need mothers! We need people to care for our fledgling organization and nurture it into adulthood. We need leaders, workers, people with vision and determination. Animal Help Now is more than a service that connects people who need help with animal emergencies with people who can provide such help. We are more than a wildlife 9-1-1. Yes, Animal Help Now is the best service of its kind. But the organization also plays a crucial role in educating the public about mitigating threats to animals and strengthening the increasingly important bond between humans and wildlife and indeed all animals. The organization this year is ramping up its collaborative work with humane wildlife conflict resolution professionals to teach and empower people to live more harmoniously with wildlife. Just as sure as the world needs the best kids, the world needs the best nonprofits. And the best nonprofits have the best mothers. Is your nest empty? Does it have room? If so, please let us know! And if another person comes to mind who might be good for a leadership role in Animal Help Now, please forward this email to her or him. As always, thank you for reading and for your kind consideration. Have a great weekend!